While we are all impatiently waiting for Tiggupirus Set Review (btw, tiggu, credit given to you for calling painful truths a great card, i believe it's gonna be a highlander staple for a long while). Both walkers seem fine, but not like hl staples. Here is my set review with the top 30 cards, which I think could see play. All the cards with the $ ($ represents colorless mana. ), look unplayable right now in normal decks. Most decks have a maximum of 5 lands which produces colorless mana, so without a huge cardswap these cards look too unconventional right now, but maybe there will be other cards in the future for this. 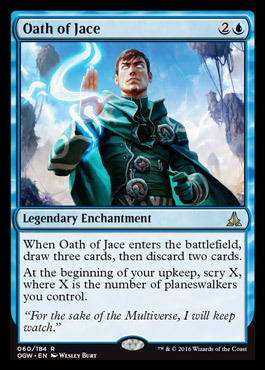 At the beginning of your upkeep, scry X where X is the number of planeswalkers you control. // Will see play in UR,UW and so on. // Shambling Vent has seen play so this will also see play. This is better against creatures(especially in a defensive way) as the Vent plus it has the colors which 4C Blood need. // Will definetly see play in our 'all player favorite' 4C Blood deck. You may spend mana as though it were mana of any color to cast planeswaker spells. 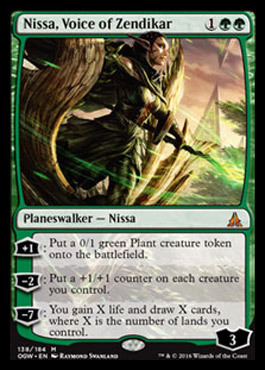 // A green Ponder for 75% of all 4C Blood cards, which later helps casting Planeswalkers. [+1]: Put a 0/1 green Plant creature token onto the battlefield. [-2]: Put a +1/+1 counter on each creature you control. [-7]: You gain X life and draw X cards, where X is the number of lands you control. // This card reminds me of Sorin, Lord of Innistrad in all 3 abilities. A cheap and very protective 3 mana planeswalker with an card advantage ultimate, the cheaper a planeswalker is the easier accesable becomes the ultimate. // This card is made for Token Highlander, even if they are played seldom. This card would also fit in defensive green highlander or as a cheap substitute for Sorin in a 4C-Blood Deck. [+1]: Put two 3/1 red Elemental creature tokens with haste onto the battlefield. Exile them at the beginning of the next end step. : Discard all the cards in your hand, then draw that many cards plus one. 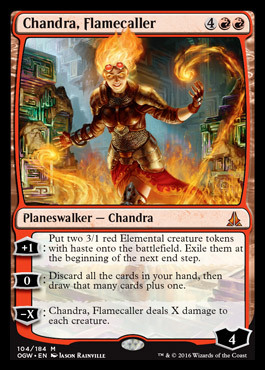 [-X]: Chandra, Flamecaller deals X damage to each creature. // This card has all abilitys that you want, it destroys creatures, makes direct damage and generates card advantage. On the first look it appears weaker than Elspeth, Sun's Champion(for not handling big creatures) but if you search for an true allrounder and you can pay 6 mana than this card looks perfect. // This card looks tempting, playing mono blue or else lacks a haster which deals efficiently with Planeswalker, also every removal becomes a 2-1 swap. The problem is the $ in it's mana cost, I just can't imagine that decks add more colorless lands, or that five lands are enough for casting this Eldrazi. // Limited to Izzet Burn where you really play Carddraw into Burnspells. // This card is extremely dissapointing and only efficient against decks with much burn spells, where you can swith power and thoughness more than once. This card will see play in Izzet, because Izzet is just lacking manafixing with a manland. 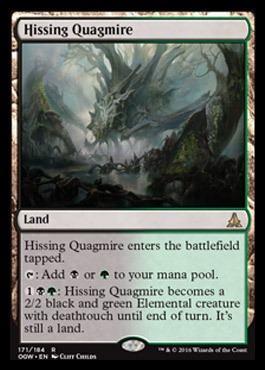 // This common looks interesting it's a suprise removal against planeswalker and against medium sized creatures. // Strictly limited removal weak green decks. // A flying Monastery Swiftspear for an Izzet Aggro Control, the same deck which plays Kiln Fiend and Wee Dragonauts. // This card is the combination of Eternal Witness and Kitchen Finks both had seen extensive play so I expect this card to see play too. Return all nonland permanents to their owners' hands. If Crush of Tentacle's surge cost was paid, put an 8/8 blue Octopus creature token onto the battlefield. // Strictly limited to blue+x control decks. I submitted today the first part. Do not know when it will get published. The whole article was over 9000 words at that point. The final count is probably going to be over 10k. When did these start get so massive? As foreshadowed, here is the first part. Turns out Poromagia had some issues with their blog as they changed the layout recently. Seems like they got it fixed. I could have used this time to actually playtest a lot of the cards, but schoolwork piled up, so lot of this is a bit too theoretical for my liking. At this rate, I hope I have time to write for the next set. So now we have his complete set review.